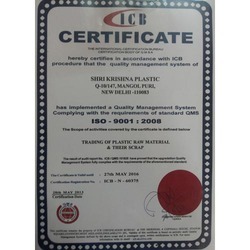 Shri Krishna Plastics ISO 9001 : 2008 certified company, formally began its operations in the year 1999, as one of the leading traders and suppliers of a highly commendable range of Granules & Scraps. Quality products like, HIPS Granules, TPR Granules and Plastic Granules, having high demand in the market, makes up this range. For the purpose of manufacturing these products, we abide by the industry set standards and utilize the finest raw materials and modern machines which is available at our vendors end. Owing to this, the functionality it provides and its superior service life, is highly commendable in nature. Further, we provide a highly commendable product range to our clients at the best rate possible. AT our vendors end they have maintained ultra-modernistic Infrastructure, equipped with all the required machinery and equipment, is what helps us in attainment of several of the firm’s goals and objectives. Regularly upgraded, it helps us in maintaining and improving our market standing. In order to manage the facility in a better and finer manner, it has been parted into several highly operational units. The units are guided and governed by some of our most skilled professionals. This helps us in maximizing our production capacity and improving the standard of quality. In addition, our abidance of the industry norms, have helped us attain several highly reputed clients. Mr. Shri Krishan (Partner), the partners utilizing their domain expertise and analytical & management skills, have made the firm surf its way through a number of high and low points. Further, their interest in development of the firm has resulted in regular training sessions and rewards for the employees. Trading, Importer, Exporter and Outsource Manufacturing of Plastic Granules and Scraps. At our firm, we believe in providing our clients the best that is available in the market. Thus we engage in using of the finest raw materials and modern machines, as per the set industry norms. Owing to this, the offered products’ functionality is impeccable in nature and working life is highly commendable. Post production, the offered products are sent to our team of highly skilled quality professionals, who with high precision examines and eliminates any and every manufacturing defects. We are proud to have a team of highly enthusiastic employees, who direct all of their efforts, towards attainment of the firm’s goals and objectives. These employees are recruited on the basis of their skills and ability to handle situations. For the purpose of better management of this team, it is sorted into a number of highly operational units. The division is done on the basis of their expertise in specific vocations. These units help us in boosting the firm’s productivity and standard of quality. We are known to be amongst the leading traders of this commendable range of granules & scraps. For the purpose of maintaining this market standing, we engage in using of the finest raw materials and modern machines, as per the set industry norms and guidelines. Owing to this the product’s quality is highly standardized, has a longer functional life and a superior functionality. In addition, the offered range is packed in the most commendable manner and delivered with utmost punctuality.